Turnips are creamy-white with a lovely purple, red or greenish upper part where the taproot has been exposed to sunlight. 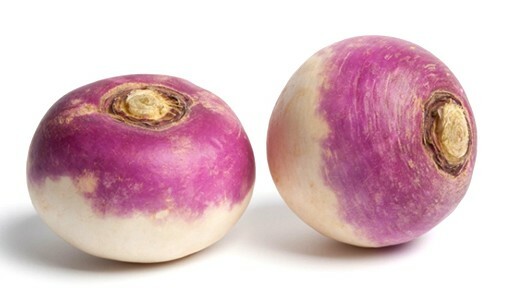 Like swedes, turnips are a root vegetable and member of the cabbage family. They are a good source of vitamin C and, before the arrival of the potato, turnips were one of the main sources of sustenance for the English peasantry.Turnip leaves or ‘greens’ can also be eaten boiled, steamed, stir-fried or grated into salads.